From Light Shining in Buckinghamshire, at NYTW. In 1976 Caryl Churchill collaborated with Joint Stock Theatre Company for the first time to write a play about revolutionary fervor, apocalyptic visions, political optimism, and a powerful left-wing movement crushed by committee, greed, and internal factionalism, ultimately making way for the restoration of a selfish, rich status quo. No, she wasn’t a prophet — or perhaps she was, insomuch as human beings tend to repeat our worst mistakes, and a wise artist can sometimes hold a mirror up to these disheartening eternal returns. Like Arthur Miller when he wrote The Crucible, Churchill was interested in examining a historical moment at some remove — that thing we like to refer to quaintly as a period — to shed light on present political injustices. She and Joint Stock director Max Stafford-Clark were fascinated with the radical religious and political movements that sprang up during the English Civil War in the 1640s, and after a workshop period with the company’s actors, she went away to write about this brief epoch of ecstatic hope: a moment in England’s history, in the turbulent gap between kings, when it really did seem that broken systems might be remade, inequities righted, a country made more generous, more just, more free. The play that resulted was the dense, fragmentary Light Shining in Buckinghamshire, now in a rather ponderous production by Rachel Chavkin at New York Theatre Workshop. Writing in the Times about this revival (the theater also produced Light Shining’s American premiere in 1991), Dwight Garner describes the piece as “a difficult, fervent, political play … about bravery and optimism.” Yes to those first three adjectives, but one thing that this description sidesteps — and that this production struggles to dramatize effectively — is that Churchill’s play is also necessarily about extremism and failure. Chavkin and her team are passionate about envisioning Light Shining as a #Resistance play, and in certain ways that makes sense. 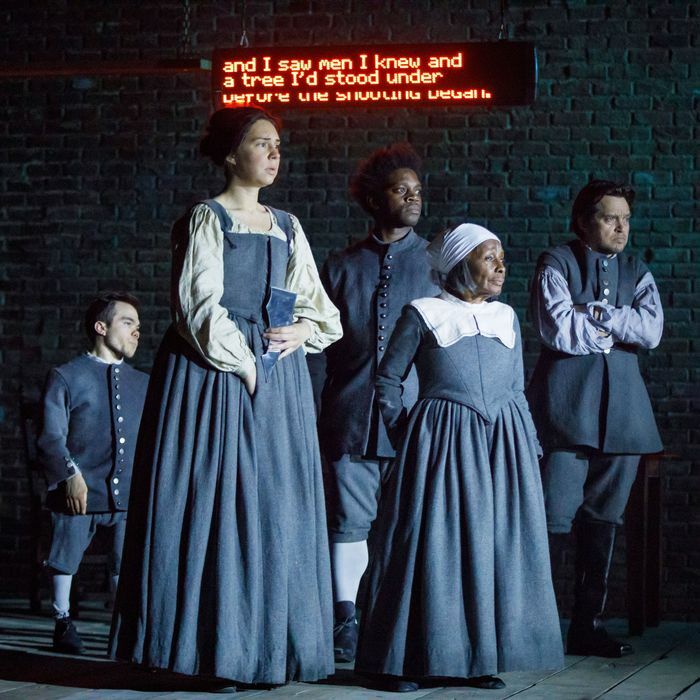 In other ways, the play is actually less about the light that flared up in 17th-century England than about how it burned out: An authoritarian parliament eventually favored protection of personal property over expanded suffrage and land rights. Oliver Cromwell massacred the Irish. The revolutionary movements broke down into unorganized apocalyptic cults (think Occupy Wall Street with a “Jesus is Coming” twist). A king returned — the Restoration of business-as-usual in this case being such a big deal that we give it a definite article and a capital R.
There’s a lot of darkness in A Light Shining in Buckinghamshire, a lot of decay and decline, and while Chavkin’s production earnestly attacks the play’s weighty, thorny text, it struggles, especially in its second act, to find a sustaining engine. After all, how do you dramatize a long, slow death? How do you maintain theatrical energy when your very subject matter is loss of momentum? That strikes me as the central conundrum that Churchill’s play throws at any director, and it’s not an easy one. Churchill isn’t easy. Her plays are often rich with (or, if you’re not a fan, burdened with) complex historical context; her characters hold forth in lengthy philosophical diatribes (they can risk becoming mouthpieces); she’s often not as interested in individually differentiated and sympathetic human beings as she is in sociopolitical landscapes, snapshots of humanity, archetypes and fragments. Her playwright’s heritage might in fact trace most directly to Brecht — also not exactly known for his accessibility. And she’s divisive: Her 2009 play Seven Jewish Children kindled heated debates over anti-Semitism, and in 2015, responding to a National Theatre production of Light Shining, the critic Lloyd Evans called Churchill “the most overrated writer the English theatre has produced” (and oh so much more). But this is hot stuff — arguments, politics, accusations, opinions, rabid claws-out takedowns! And it’s the stuff that not only surrounds Churchill’s plays but that they’re made up of. So the real question is, why should Light Shining in Buckinghamshire, a play built on a foundation of fiery debate, feel this sleepy? That’s not a metaphor. At intermission (the very talky play is almost three hours long), the man beside me apologized for snoring. He and his date didn’t return for Act Two; nor did half the row in front of me. I’m far from opposed to deliberate, knotty material, and Light Shining certainly contains striking moments and several strong performances (as with the play’s original staging, and according to Churchill’s own suggestion, six actors play a wide variety of characters), but something isn’t quite firing here. The play is made up of 21 scenes — many fictional, some drawn from the historical record — and since they don’t assemble into a single narrative but instead provide a patchwork of characters and encounters in order to give a more sweeping sense of Light Shining’s political moment, it’s incumbent upon director and ensemble to keep the sense of urgency and, even if tangentially, connection from one to the next. It’s like that sequence in The Return of the King where a line of signal beacons are lit across the landscape: With each of Churchill’s scenes, you want to feel like you’re jumping from flame to flame — then, ultimately, devastatingly, witnessing those flames die out. But here, Chavkin and her actors have to struggle to get each new vignette started, like they’re hefting a great weight each time, then dropping it, then bending over to pick it up again. But this Light Shining isn’t going there. It wants to stick to the less slippery idea, in Chavkin’s words, that these characters “are saying things are unjust, and they [want] to change that…. [They’re] fighting for acknowledgement, equality, and liberty.” That’s not wrong. It’s also not complicated. Chavkin’s production is built on the premise of support — for the general concept of Resistance, for the play’s characters, and for its ensemble, which features several actors with disabilities — and so it traps itself in a corner. Its project is in many ways admirable and yet in others, unable to access the troubling nuances of the story Churchill is telling. This may be why one of the production’s strongest moments occurs when the vexed historical record gets to speak for itself. Light Shining’s first act climaxes with a verbatim enactment of part of the Putney Debates, the 1647 series of meetings amongst the various Parliamentarian factions in an effort to draft a new constitution. In their own words — at once archaic and full of familiar political hedging and impassioned idealism — we hear from Oliver Cromwell, the Leveller spokesperson Thomas Rainsborough, the more conservative general Henry Ireton, and more. The scene is long and intentionally excruciating: We’re watching democracy be slowly tortured to death by debate. Spahr is once again excellent here, as the ardent and increasingly anguished Rainsborough, and Matthew Jeffers does some of his best work as Ireton, who argues bullishly for the primacy of personal property against the cries of his colleagues (like Rainsborough and the Leveller pamphlet writer John Wildman) for the expanded rights of England’s disenfranchised masses. The excellent Rob Campbell — who plays a variety of distasteful characters to great, creepy effect — also brings humor to the Putney Debates as the aggressively bored Colonel Nathaniel Rich. He wears thick square glasses, like an ’80s politician, and Spahr’s Rainsborough hands him a half-finished Diet Coke as he slumps in his chair, dead-eyed and slack-jawed. The character’s quirks are among the more effective of the show’s many anachronisms — Chavkin and her costume designer Toni-Leslie James push the aesthetic from the 1640s closer and closer to the present as the play goes along — and Campbell’s performance also provides some of the few moments when things feel truly, impishly funny. Churchill’s plays aren’t necessarily filled with levity, and I longed for more moments like this: twinges of satire, mischief, and lucidity that let us see, with painful clarity, the myriad ways in which the human quest for political progress falls prey to bureaucracy, selfishness, fanaticism, and delusion. We can’t understand the failure of the revolution while we continue to worship the revolutionary.